In this game, 54 of the vilest villains have been stuffed into a BrainBox. It wasn't easy but we managed it! Perfect for children and adults of all ages over the age of eight. Players have to look at a vile villain card for ten seconds and then answer a question based on the roll of a die. As you would expect all the gore has been left in,including some great facts about history's most notorious villains. Did you know that Ivan the Terrible liked sticking his enemies heads on wooden poles or that Attila the Hum died of a nosebleed on his wedding day? 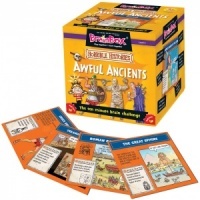 Fascinating facts;beautiful illustrations and a great way to learn history. 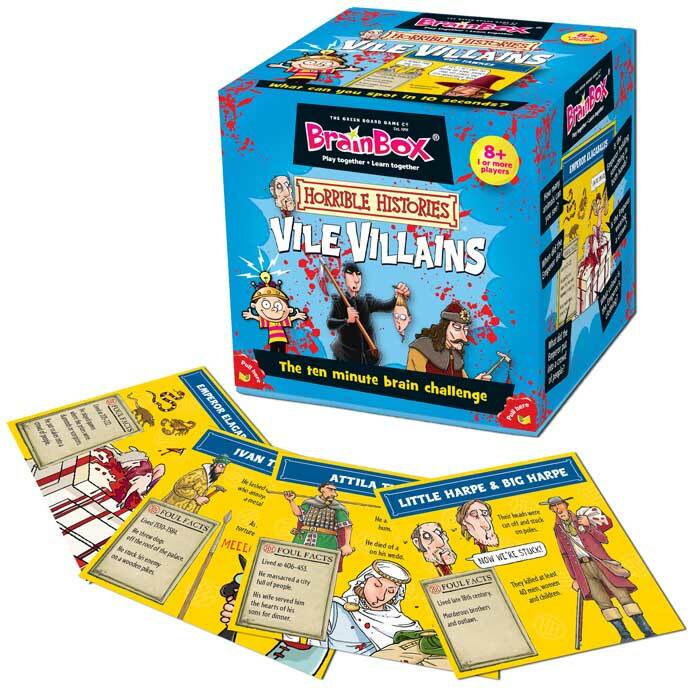 If you like Horrible Histories,you will love BrainBox Vile Villains! Contains: 54 cards, 1 rules card, 1 sand timer and 1 die. Find out how truly awful our ancestors were!